Keokuk, IA – After a string of shutdowns and demonstrations this weekend, another Water Protector shutdown a construction site in Keokuk, Iowa this afternoon. 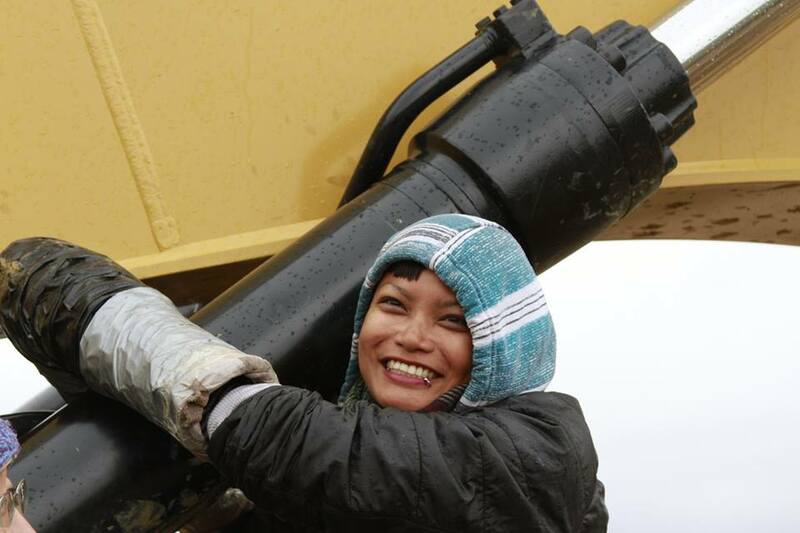 Krissana Mara, 31, of Thailand, arrived as a water protector of Mississippi Stand about a week ago and locked down to an excavator earlier this afternoon at a Dakota Access Pipeline in Keokuk. At approximately 1PM Mara arrived at the construction site. Pipeline workers left the site and police, fire department, and ambulance arrived shortly after. Press was on the scene and one credentialed member of the press was arrested for trespassing as well. This is the second member of the Press that has been arrested within a week by Lee County Sheriff’s Department. This direct action follows Mississippi Stand’s stance as a nonviolent direct action to stop the Dakota Access Pipeline. Mississippi Stand states that it is a nonviolent direct action campaign with aims to stop drilling of the Dakota Access Pipeline through the Mississippi River. Mississippi Stand states that theirs is a strategic location as it is the only known site where Dakota Access is drilling underneath a major aquifer. Opposition to Dakota Access Pipeline continues to grow, as yesterday actress Shailine Woodley was arrested on film while joining water protectors in North Dakota. Dakota Access Pipeline has obtained additional permits from the Army Corps of Engineers to continue drilling until December 31st. “This was expected, and we are prepared to stand on the right side of history — against big oil and the desecration of our resources until this pipeline is stopped,” said Jim Arenz, a media coordinator at Mississippi Stand. Mississippi Stand claims their numbers have quadrupled since the eviction notice served last week and that their supporters continue to grow both locally and nationally. Mississippi Stand plans a rally in downtown Keokuk Friday evening starting at 5:30PM, starting at Victory Park to march up Main Street to the courthouse steps where there will be speakers from the local community talking about the Dakota Access Pipeline. This entry was posted in News and tagged Dakota Access Pipeline, Last Real Indians, LRInspire, Mississippi stand camp by lrinspire. Bookmark the permalink.